Stock earnings are regular events on stock markets. Each company reports its results 4 times a year. They can be good but also bad. They can surprise investors positively and also negatively. But much more important is that nobody can predict how investors will react. It is possible that investors start selling shares after very good earnings reported by a company. This is a very common situation. I was contacted by my client who is learning to be an active investor. He wanted help with what to do with his holdings of RVBD shares. 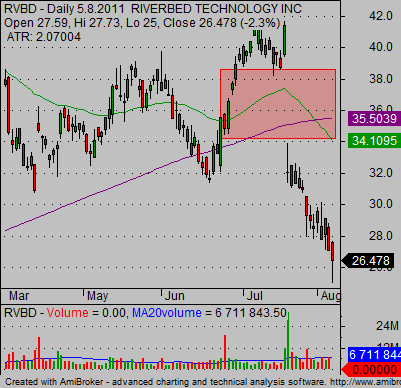 RVBD reported earnings and shares started to trade the next day with a huge gap down. 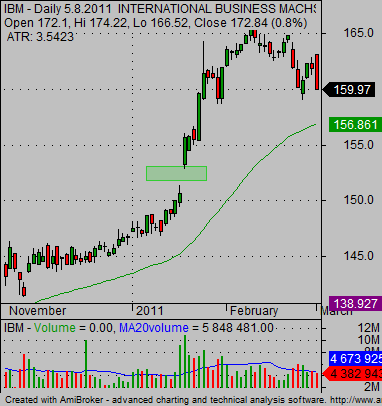 Check this stock chart of the situation. Shares finished near 42 before earnings and opened near 32 after earnings. That is a 24 % drop. My only advice to handle such an event is to get out immediately. Investors are receiving new data about the company’s business. They can be good or bad but the most important is how this data fits investors’ expectations. And it is not possible to predict the reaction of investors to these data. 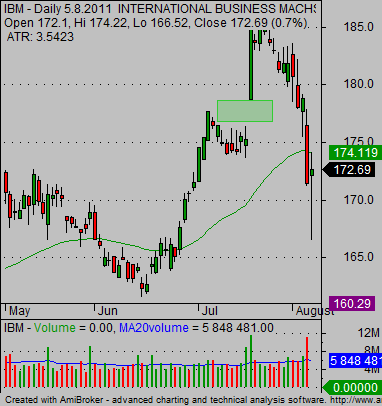 Therefore it is very good for risk management to not hold any shares during earnings events. Here are some more examples of bad reactions in share price after earnings. Drops in share price are so huge that it is very risky to have any shares during these days. I always close my trade before earnings date. It is an important rule for in my stock trading strategy. If I find it appealing for me after the announcement I will start to monitor shares again and think about a possible new setup. It is also possible that investors react positively to the announcement and shares open up the next day. But such a gap up is not so huge as possible gaps down. So the risk reward ratio of possible gains versus risk is not favorable. 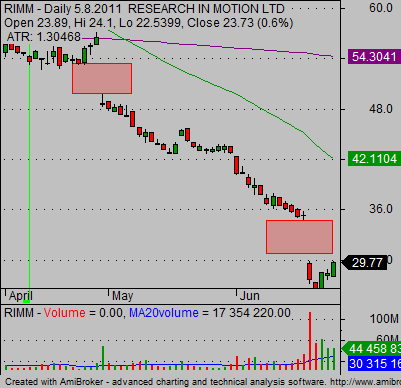 Here are examples of gaps up of price after positive reactions to this event. And it is almost always possible to enter the trade at a relatively good price after earnings again. There are four periods during every calendar year when companies report their results. I recommend checking the earnings calendar for any stock you want to trade. It is possible to find date of earnings release for every US stock market ticker on a good online trading website like FinViz. Learn how to use this feature.